We got back to the mainland last night but managed to extend the holiday for nearly another 24 hours by staying at a friend’s place at Pt Willunga last night. This meant we went the Farmer’s Market at Willunga this morning for some yummy fresh produce and went for a swim at Pt Willunga before driving home. Here’s a small taste of what we enjoyed at Kangaroo Island. 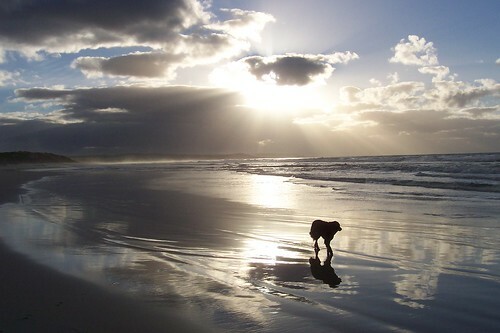 This was not long after sunrise at Vivonne Bay where we were staying, with Monty in the foreground. I was awake about 7 each morning but always stayed in bed until this morning, our last, and the best weather. The beach was absolutely gorgeous and we had it all to ourselves nearly most of the time. There will be more to come as we had some good adventures. What a beautiful picture Jen. So glad you and JJ had a good time; but nice to have you back too.